"It will open new frontiers for the present and future of foldable vehicles"
"Revolve occupies up to 60% less space"
Revolve occupies up to 60% less space when folded and can be used in all conditions. When folded it allows the user to easily store it at home, in a backpack, in a trolley, in a trunk or even in the overhead baggage hold on an airplane. 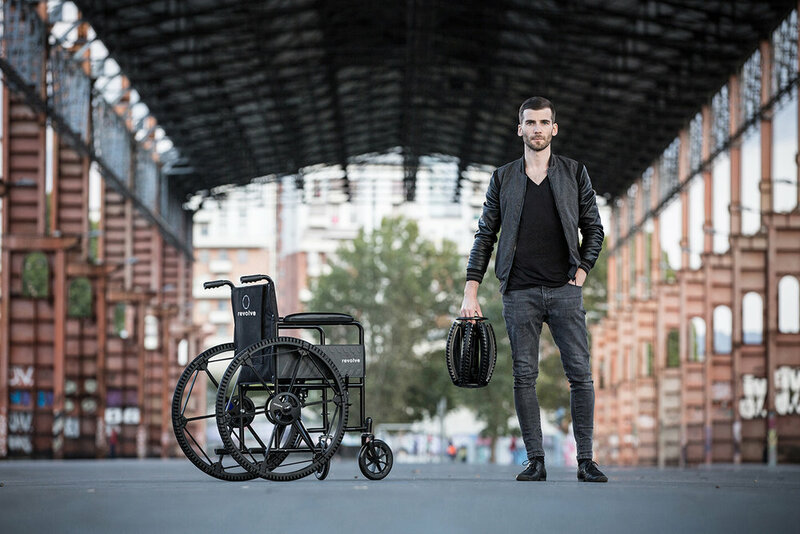 Revolve has been invented and designed by Andrea Mocellin with the aim to be the first modular wheel. Which in turn will open new frontiers for the present and future of foldable vehicles. Its simplicity and compact design makes Revolve an iconic and unique product never seen before. LARGE WHEELS are required in all man powered transportation for PERFORMANCE AND EFFICIENCY. By not having a large wheel to store, Revolve is solving problems for millions of travelers and adventurers. Breaking down PEOPLES MOBILITY starting with the wheel is a new challenge that can bring NEW AND MORE EFFICIENT VEHICLES FOR EVERYDAY LIFE. For the traveler, the dreamer and the commuter, a new way to save space and time. With a simple action you can OPEN AND CLOSE the wheel making it practical and convenient for every user. Its portability is guaranteed with two handles that lock and unlock the wheel when unfolded. Revolve is been design and invented by Andrea Mocellin with the aim to open new frontiers of foldable vehicles. Revolve occupies up to 60% LESS SPACE when folded (from 665mm to 260mm) and can be used in all conditions. When folded it allows the user to easily store it at home, in a backpack, in a trolley, in a trunk or even in the overhead baggage hold on an airplane. It is compatible with most bicycles and wheelchair designs as well as every mode of transportation using large bicycle wheels. The smooth edges and simplicity only enhance the practicality of Revolve. Every segment comes together to guarantee the same fluidity as a common wheel guaranteeing universal large wheel efficiency. Revolve’s unique hexagon structure provides a solid and iconic design when open or closed. 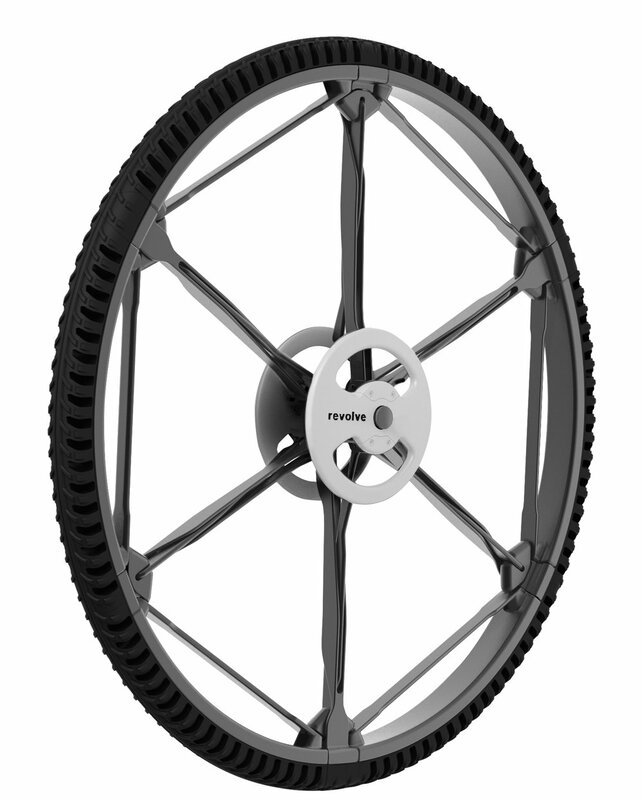 The airless tire allows for a compact and modular structure, nothing ever seen before. The practicality of the structure does not give way to the beauty of its design. Suitable with your house to save space and time. Transporting Revolve everywhere is easy thanks to its ergonomics. The side handles are designed to make Revolve your best companion. Large wheels are requiring in all human powered transportation for performance and efficiency. With Revolve the paradigm of not having a large wheel easy to store is solving the problem of millions of travelers and adventurers. Starting with the wheel is a new challenge that can bring new and more efficient vehicles for everyday life. For the traveler, the dreamer and the commuter, a new way to save space and time. Open or closed Revolve gives a second life to the wheel. Revolve is suitable with most wheelchair designs. Its solid and robust structure makes Revolve reliable and safe. Discovering the details behind Revolve. Its simple looking but incredibly complex problem-solving design has been studied to guaranteed universal large wheel efficiency in every condition. "TO MEET THE DEMANDS OF TODAY"
Revolve is the wheel in a new form, evolved to meet the demands of today. In order to achieve the most efficient and accurate folding mechanism hundreds of 3D models and prototypes have been created over the years. The mission was to build the most compact wheel ever made, with inspiration from robotics, universal joints and the Omni wheel. Revolve’s unique HEXAGON STRUCTURE provides a SOLID and ICONIC DESIGN when OPEN or CLOSED. All kind of bicycle can benefit from the compactness of revolve. Especially the new generation of foldable bicycle can use large wheel to maximize performance and usability. The Wheelchair can benefit from large wheel easy to store everywhere, anytime. 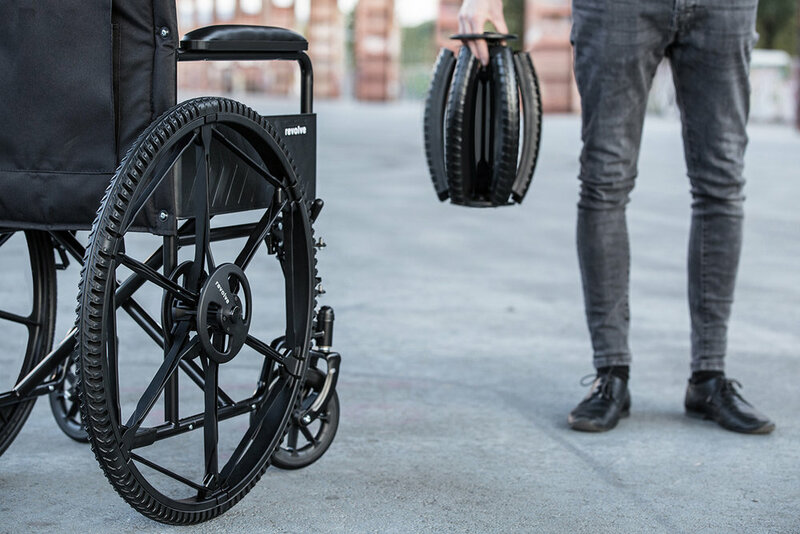 Compact and solid, revolve aloud the users to safely use the wheelchair in every condition with a modularity never seen before. A total new experience can be evolve with the integration of revolve. Robotics, land drones can easily be more usable thanks to large wheels and more possibility to approach all terrain. 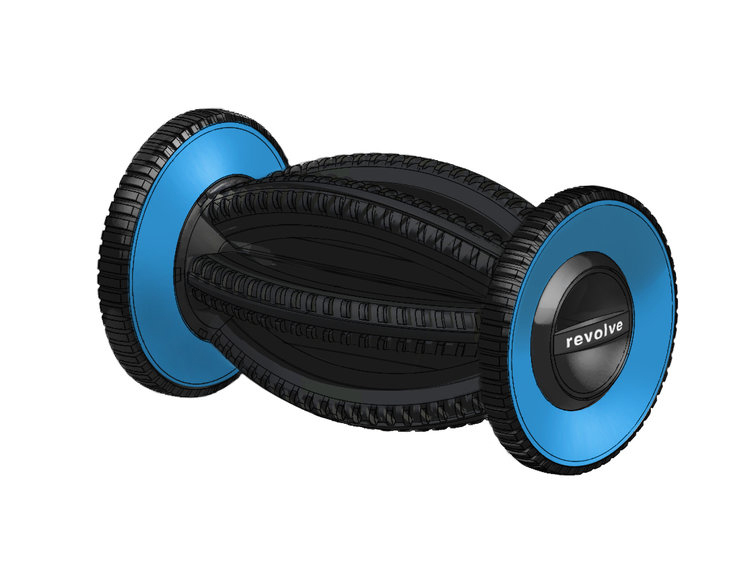 With Revolve you will be able to travel everywhere and easily carry the wheel between trains, airplane and cars. Your journeys will be much easier and modular thanks to its use. Same for bike carts, trolley and backpacks. It is compatible with most bicycles and wheelchair designs as well as every mode of transportation using large bicycle wheels. "IT WILL OPEN NEW FRONTIERS FOR THE FUTURE OF FOLDABLE VEHICLES"
"NEW AND MORE EFFICIENT VEHICLES FOR EVERYDAY LIFE"
For the traveler, the dreamer and the commuter, a new way to save space and time. Large wheels are required in all man powered transportation for performance and efficiency. By not having a large wheel to store, Revolve is solving problems for millions of travellers and adventurers. Revolve aloud unique design and the opportunity to integrate new storage space in a common bicycle architecture. "A GLOBAL AND MULTITASKING BIKE"
Your next trip will be easier and more practical. Revolve will easily become a trolley to move everywhere. Moving faster in crowded spaces. 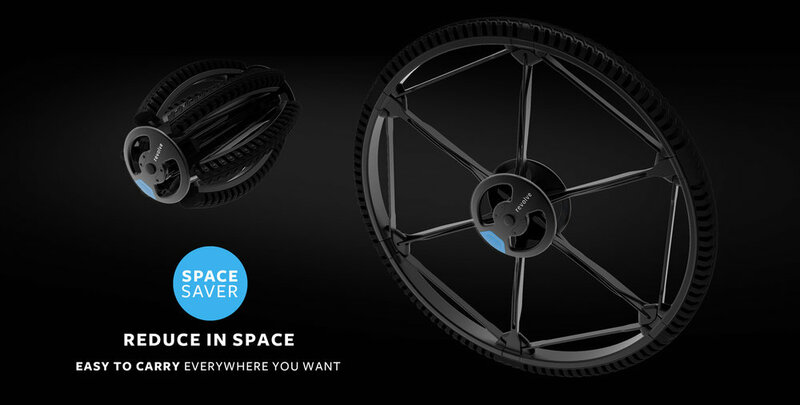 Revolve gives a second life to your foldable vehicle. "PLAN YOUR NEXT JOURNEY WITH REVOLVE"
The unfolded wheel can integrate two auxiliary rollers to guarantee a perfect functionality to the unfolded vehicles. The combination of a compact wheel and an extremely efficient side wheel open totally new opportunities to the future of the foldable vehicles. The wheel unfolded can perform as an independent and modular object to save space and guarantee performance and solidity. The two omnidirectional wheels guarantee the perfect steering in every situation, even the most crowded spaces. To guarantee stability and performance the rear wheels follow a single direction. Perfectly suitable to scooter and trolley configurations. "MEET THE NEXT GENERATIONS OF TRAVELLERS"
This falls in line with the way that younger travelers see themselves. Rather than tourists or travelers, the next-generation has taken back the concept of being an explorer – the world is there to be discovered. Global human population growth amounts to around 75 million annually, or 1.1% per year. The global population has grown from 1 billion in 1800 to 7 billion in 2012. It is expected to keep growing, and estimates have put the total population at 8.4 billion by mid-2030. Parking dramatically changes urban landscapes—for the worse. Large areas of downtowns have been given over to asphalt, breaking up pedestrian areas of restaurants, shops and offices, and making cities less conducive to walking or cycling. "IT SIMPLY MAKES YOUR DAY EASIER"
"DESIGN TO FIT EVERYWHERE, EVEN IN THE MOST CROWDED SPACES"
"REVOLVE IS SPACE SAVER AND GIVES A SECOND LIFE TO THE WHEEL"
Current bike sharing stations occupied large spaces around the cities. 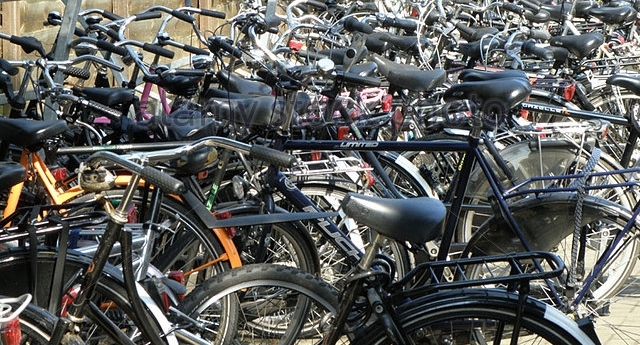 Reducing the size of the stations with the same quantity of bikes will dramatically decrease the spacing between stations. "With Revolve we can have more bikes in less space." Revolve dramatically reduce the space occupied by bikes and wheelchairs. 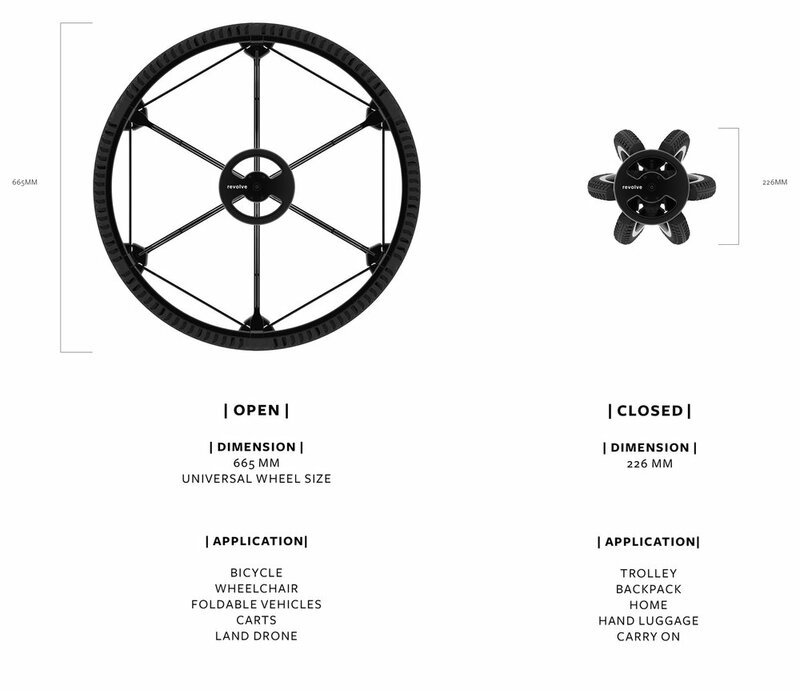 Its modularity will open new frontiers in the way we share, store and collect bicycles and wheelchairs. 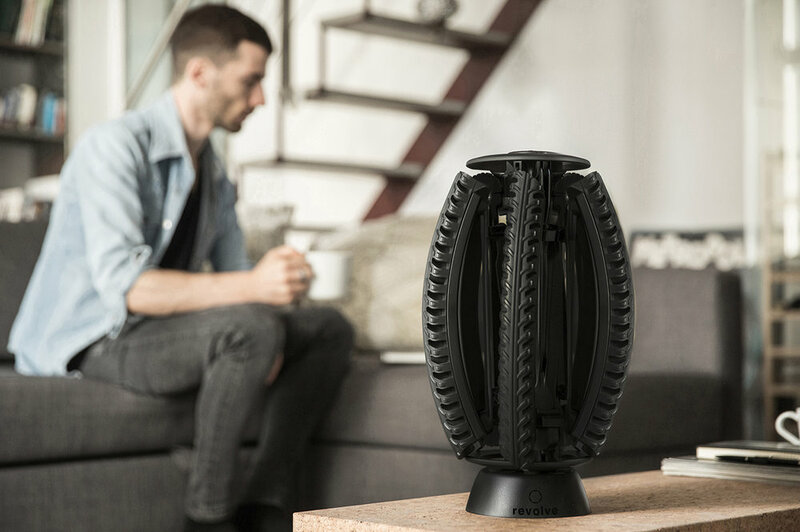 "A totally new way to store and collect bikes." An insight behind the invention of Revolve. Its design development and raison d'etre. An accurate illustration of its evolution from the first sketch to the final prototype.